As one gets older one is concerned about health issues but for me it is mental issues that worry me most. My mother suffered from Alzheimer’s Disease during the latter years of her life and I wonder if it is inherited and passed down to the children. Definition of Alzheimer’s – Alzheimer’s disease is a progressive, degenerative disorder that attacks the brain’s nerve cells, or neurons, resulting in loss of memory, thinking and language skills, and behavioral changes. My Name is Jane, I think. but I don’t know their plan. They are beginning to scare me, what is there to fear? Proud, strong and upright my life in my hands. Well if I am not me then where did I go? I wish you could tell me why did they disappear? But again I don’t know them why are they taking my hand? 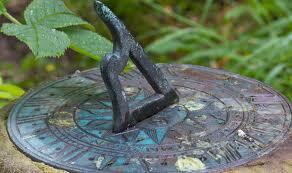 So how could I have landed here – is this the end? And now I feel that I have left me behind. And I really feel that I’m perfectly sane. Who I used to be? Judith Baxter Blogger, mother, grandmother and friend. 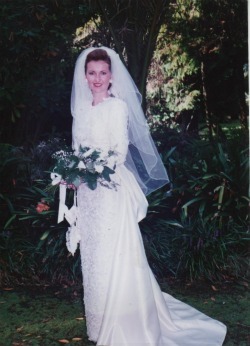 For four years I acted as the Wedding Coordinator at Old St Pauls a local historic church. 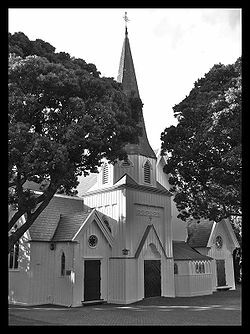 The church had been built in 1866 and was superseded in the 1970s by the new Cathedral of St Paul nearby. But the old church was never de-consecrated and it continues to be used for weddings,whether civil or religious. Weddings for all faiths have been held and during my tenure we had between 90 and 100 weddings each year. One memorable year we had 101 weddings, 28 of which were held in March. On the 31st of the month, having coordinated 4 weddings and a rehearsal, I went home and dropped into a chair with a glass of wine. I switched on the TV and horror of horrors the movie being played was ‘Four weddings and a funeral”. Of course, all brides are beautiful but I really think my own brides are just fabulous. Our daughter, Cate was married on a glorious October day. Early spring in New Zealand. 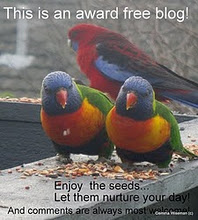 The sun shone, the birds sang. Proud father, mother and brother – what more could one ask? Our son and daughter-in-law Rose were married in March the beginning of autumn here in New Zealand. After days of pouring rain, the sun came out on this lovely bride, the sun shone, birds sang and both mother and father-in-law smiled on our new daughter. 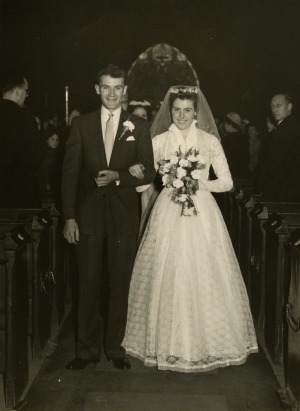 We were married on a foggy, November Sunday afternoon in London in November in 1957. At that time weddings were only ever performed in churches or other places of worship or Registry Offices and never on a Sunday. Because of my Mother’s upbringing in the Jewish Faith she wanted us to be married on Sunday and so we had to obtain the permission of the Archbishop for this. And as the wedding had to be completed prior to sunset and before the evening service it was at 4.45pm. 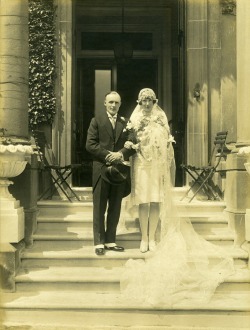 My parents were married in 1935 in London. Sorry about the quality of the photo. It’s the best we could do. My Mother was so tiny and on one of my visits to her, when she was in the early stages of Alzheimer’s she told me she had a lovely dress upstairs that perhaps I would like. 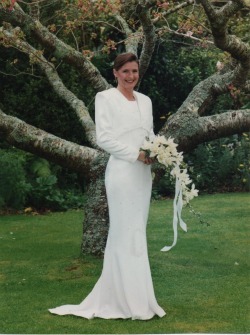 I still have that beautifully hand-made silk dress. She was so very tiny that none of us would ever have fitted into it. 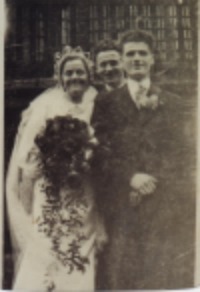 Bob’s parents were married in 1928 in Dunoon, Scotland but it was a short married life as she died some 4 years later. She left a small son who was brought up by his two maiden aunts in the family home. And here are a few true words from the late, great John Lennon, my favorite Beatle.